It may have taken Kobo 6 weeks to catch up with Amazon, Sony, Google, et al, but today I have some good news to Kobo owners. Kobo has just announced that you can now transfer the Harry Potter eBooks that you bought from Pottermore to your account at Kobo. Once they're in your Kobo account, you'll be able transfer the ebooks to your Kobo devices just like you would any other ebook you purchased fro Kobo. All 7 titles in the series are also listed in the Kobo eBookstore, though you will need to have an account with Pottermore in order to buy them and then transfer the ebooks to your Kobo account. 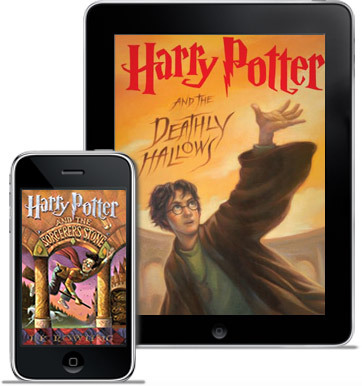 Pottermore is still the exclusive site to buy all Harry Potter ebooks (in 6 languages) as well as Harry Potter audiobooks. Pottermore has proven to be exceptionally popular, and it is quickly growing into one of the larger niche online communities. While the ebookstore has been open since the last week of March; the community has been up and only since the middle of April. It's grown a lot since then, logging over 7 million visitors in the first couple weeks. The site now has over 3 million members enrolled as pupils at Hogwarts, the fictional school of magic featured in the novels. The Pottermore eboosktore is also doing quite well, boasting of an eye-opening £1 million in ebooks sold over the first 3 days and £3 million sold in the first month. Bloomsbury, publisher of the print edition, has also noted that the print sales have also increased since the launch of Pottermore. Well, if you bought the books at Pottermore before May 17th you can’t link your Kobo account to your books. I contacted Pottermore a few weeks ago about it but so far the problem hasn’t been fixed.